In November and December of 2014, I began a writing spree like never before. The urge to write became so strong that I could not sleep at night. After the New Year, the unusual urges I experienced to write increased even more. It got so bad in early January, 2015 that it began to make me question if I was ever going to be able to sleep again. As January progressed, I began writing an incredible essay on “The Beginning of the End Game.” The more that I wrote the more I realized this was a really significant event. I finally recognized my insomnia was being caused by Michael Morris information coming through stronger than ever before. For 10 days straight Michael and I have written a lot of words that describe the details of the End Game that is about to begin. The book is now finished. 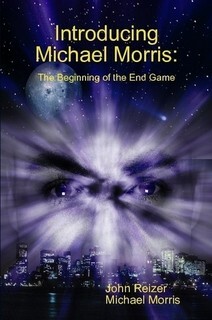 Twelve years after the original Michael Morris novel was released in 2003, the nonfiction sequel has been finished. It will be released in early April, 2015. It is the best collection of writings that has ever come from my (our) fingers and it explains what we all have to look forward to in the coming months. Now I can rest again. The insomnia is finally gone. The new book’s back cover blurb is provided below. More information about the publication’s release will be forthcoming in March, 2015. It will be available at Amazon.com and other booksellers worldwide in early April. I will update readers here as well about official release dates and distribution availability. Extensive changes are taking place on third dimensional Earth. The frequency signatures paving the way for what is occurring worldwide have been taking place for quite some time. In spite of this fact, a large majority of people have not yet sensed what has become perceptible to others in different dimensional constructs. The changes, already in progress, are being sensed by some human beings! Human awareness will increase rapidly in 2015. As amazing as the changes will seem to the average person, it is important to remember that everything is actually an illusion, made possible because humans have agreed to participate in the most amazing virtual reality experience in the universe. There are powerful groups interacting with Earth that have been working hard to suppress human awareness regarding the extensive changes taking place. Their abilities to continue suppressing the truth through the end of 2015 will not be possible. scenarios. There are no doom and gloom scenarios attached to any of the forthcoming changes. Everything is happening, universally, because Vast Intelligence has prescribed it this way. It is vitally important that readers understand there is nothing to fear in any of the lifetimes we participate in. Everything sentient beings experience is predicated on garnering knowledge for Vast Intelligence. In this book, Michael Morris describes in great detail what the End Game will really mean for human beings and other forms of life on earth. Our limited perceptions of reality are very far removed from what is truly taking place in the world and throughout the universe. Until society gets a clue and begins to understand that what we are being fed by trusted media sources, concerning most current events, is inaccurate and misleading, we will continue to struggle in our attempts to comprehend the true nature of reality. This book attempts to enlighten readers by offering them a collection of essays that have to do with the various lies we are routinely served on a daily basis. It is my hope that the subjects covered in the text will bring to light for some a perspective of reality that they might not have otherwise explored to date.